Jennifer’s extensive legal expertise provides large and small businesses, agricultural producers, banks and individuals with effective outcomes. As an experienced litigator with an emphasis on bankruptcy, banking, civil litigation and employment law, Jennifer helps clients navigate the complex and confusing process when they are sued or when they need to assert their rights against another. A seasoned professional in all aspects of bankruptcy and debtor-creditor rights, Jennifer handles complex and sophisticated matters on behalf of clients. 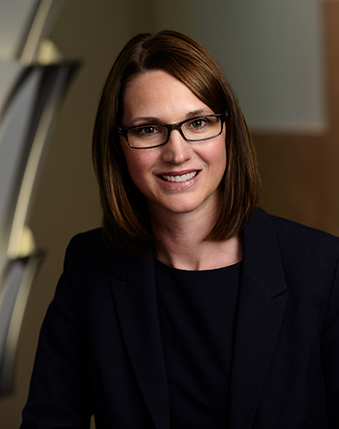 Jennifer currently serves on the panel of Chapter 7 bankruptcy trustees in the District of Minnesota. As a trustee, Jennifer is the estate representative for the recovery, preservation, liquidation and distribution of Chapter 7 estates and the fiduciary responsible to various parties in interest in a case. When not assigned as a trustee, Jennifer assists individual and business creditors attempting to collect through the bankruptcy process. Jennifer strives to understand the needs of each client and to provide counsel in a manner that will help to simultaneously achieve both business and professional objectives. Outside the office, Jennifer enjoys biking, swimming, cooking and spending time with her husband and two children. In 2016, Jennifer Lurken successfully defended her client against avoidance actions in excess of $20 million. The client had loaned $20 million to the bankrupt debtor and the bankruptcy trustee was attempting to undue the transaction and recover not just the principal paid to the client but the interest as well. Prior to trial, as a result of Jennifer’s legal research and investigation skills, she was able to obtain a favorable settlement for the client. Jennifer routinely represents banks and other lenders in pursuing and defending fraudulent transfer claims. In 2014, Jennifer Lurken successfully tried a dispute over ownership in the Bankruptcy Court. Jennifer’s client was claiming ownership in real property based upon a signed deed from the debtor’s father. The debtor’s father claimed he had not executed the deed and therefore, he was the rightful owner of the real estate. The Bankruptcy Court ruled the deed was in fact signed by the debtor’s father. Therefore, the real property was the debtor’s asset and could be liquidated for the benefit of the unsecured creditors. In 2017, Jennifer Lurken represented a bank with a blanket security interest in all of the borrower’s equipment and other personal property and real estate. After debtor filed bankruptcy, Jennifer obtained relief from the automatic stay. Jennifer then used her negotiation skills to obtain an agreement from the bankruptcy trustee and the debtor for the turnover of the equipment and real estate via deeds in lieu of foreclosure. Jennifer has represented lenders in cases involving foreclosure, secured interests, priority disputes, tax liens and loan defaults. In 2012, Jennifer Lurken was appointed as the receiver to manage a hotel. The hotel owner was in default on its secured loan. The secured creditor desired the hotel to be sold as a going concern in an effort to maximize value for purposes of a sale. Jennifer installed new management over the hotel, decreased the deficit the hotel was operating under and sold the hotel, allowing the secured creditor to recover more than it would have recovered in a liquidation. Jennifer Lurken successfully tried a non-compete agreement case to a Judge to enforce a non-compete agreement. The employee claimed, the non-compete agreement was invalid and unenforceable. The employee also claimed to the extent the non-compete agreement was enforceable, he had not violated the non-compete agreement. The Court ruled the agreement was enforceable and that the employee had violated the agreement. The parties quickly settled the issue of damages after trial. Jennifer has appeared in numerous employment matters addressing non-compete agreements, discrimination and termination issues.